Hands Cleaners work up and down the country to provide commercial window cleaning in Nottingham and across Nottinghamshire. We have over 40 years’ experience of cleaning windows all shapes and sizes with expert staff who are fully qualified to get the job done and finished to a high standard. Nottingham has amazing architecture surrounding the city, no matter how tall or complicated the building is we have the resources and equipment needed to leave windows squeaky clean. There are a few techniques we use here at Hands Cleaners to provide window cleaning which is more efficient for different situations. The most traditional method of window cleaning is by hand. The method has been around for many years and is effective on domestic and small properties. Cleaning by hand means we use a bucket and a ladder to go up close to the window meaning we can see marks and give the windows a thorough clean. 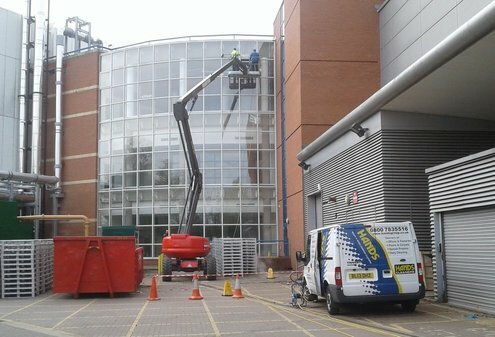 As the leading commercial windows cleaners in Nottingham, no job is too big for us. When it comes to the taller buildings, our high-level abseil window cleaning method is used. By abseiling down tall buildings, we can get close to the window and reach all windows on the building. All safety precautions are made when we use this type of method. Another way to clean windows on medium and large sized buildings is to use a high-level platform. The platform moves from level to level allowing us to clean each window on the building. We can also use our Reach & Wash Systems, which is the use of large pole that allows de-ironised and purified water through to the cleaning sponge at the end of the pole. To finish the job off, we offer interior window cleaning. As a business, you need your office to look clean inside and out, and we carry out all services at times to suit you and your business and make sure that you are not disturbed while working. With our domestic and commercial window cleaning services across Nottinghamshire we ensure they are done correctly and to a high standard, all of our staff are experienced and fully trained. If you have any particular cleaning issue, all you have to do is tell us as our employees are happy to help. Here at Hands Cleaners do not provide any long-term fixed contracts but what we do have is a guarantee and the confidence in our quality of service. Not only do we offer commercial window cleaning in Nottingham, but we also cover Derby and Leicester. Quality Service – The experience of our clients is very important to us and we make sure that we do everything in our capacity to provide the best possible results. Our commercial window cleaning services are the best for spotless windows with no streak or watermarks and no missed spots. We Care – We care about your windows. We know how important they are to the outlook of your business and with our experience, we know not only how to get them clean but also keep them looking their best. We understand the different types of windows and how they should be treated. With us, you will not only be getting the best commercial window cleaning service but also the best care for your windows. Guaranteed customer satisfaction – we take the satisfaction of our customers very seriously and we make sure that they are happy with our work before we leave. We make sure we use high-quality products and follow all the steps to achieve the best possible results. Experience – we have been offering window cleaning services for a long time and we understand their role and why you need to keep them clean. With our services, you will not only have a team that knows how to clean windows but a team that also has experience in handling customers and fulfilling their wishes. For commercial window cleaning in Nottingham, contact us today to get a free quote on 01509 501 110.